We need a thread for posting suggestions for the next version of 2011.
or "reply" to a suggestion already given if you want to continue that discussion. When the user attempts to go to an "unsafe" website, he or she will get a popup warning of the danger (as it does now). If the user clicks outside the popup, the popup will go away. 3) If the user has clicked outside the popup, the default of a) will apply. When NIS finishes an idle scan and has found some threat, a pop-up appears to inform the user of this fact. However, there are some threats that when discovered need immediate attention; and some that can be totally ignored. Extend Safe Web to Google images and other images search. Make NIS work with 64 bit os's!!!!!!! And please don't catagorize tracking cookies as a threat!!! They simply cause unnesssary worry and anxiaty. Now I only know which "threats" are found during idle time scan if I go into the reports. I'd suggest just one major suggestion per post. That way people could respond to that particular suggestion and the staff can get a feel for the response. Putting them all together like this means there will be a lot of disagreement and agreement about different items, and after awhile no one will know which suggestion the thread is about. Perhaps these posts should be considered for the 2010 product. More like "corrections" to me. 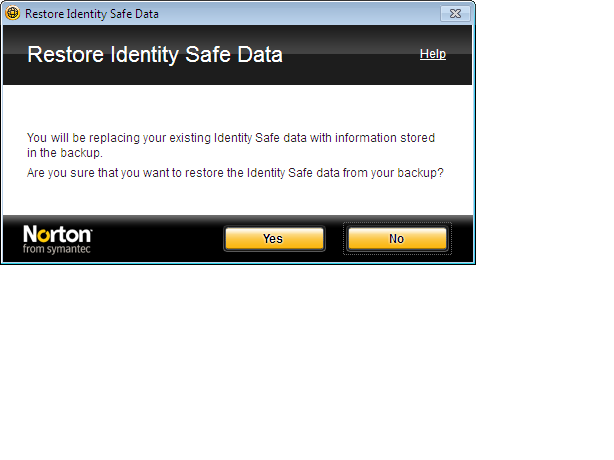 1) NIS2011 is to have portable mode for Norton IdentitySafe, whereby Identity Safe is "an indenpent" feature of NIS. Users can save encrypted information on USB thumb drive and be able to use in ALL machines, regardless whether NIS is installed. Also, higher 256 or above encryption with Keyfiles for more security. 2) Get rid of OPTIMIZE in NIS....kind of confusing to have it. 1) Improve in releasing of version updates. Right now, if there is any release of version updates, ALL users keep asking about when updates are available (me...included). Symentec should find a way to release the testing of updates not via the Community Forum, but maybe via Private Message to the testing individual. Or informed via Norton Websites that a "test" update is available and users will need to update using CHECK UPDATES....instead of LiveUpdates. So, not to use LiveUpdates for release of TEST updates, only on official release, users can have option of LU or Check Updates. 2) XP users who performed manual scanning, NIS has a menu appeared, and it cannot be minimized to system tray. Only to task tray. Minimizing to system tray and able to have ANIMATED ICONs on System tray. With different types of ANIMATION for different types of feature. For #2. Since I only have XP, I am not too sure if those features are available for Vista or Win 7. Easier access to virus and malware information within the front menu of NIS. I mentioned years ago, NIS should include dates, names, release versions of LiveUpdates patches, malwares names, dates, threat levels, Pattern Files available on the first page of NIS menu. The above information should also be readily available on the Norton Website (not hidden). Bad idea to include on the "front" page. Makes NIS too messy.... Maybe in "reports" be will be a better place of this information. Although I doubt this information is helpful for the "average" user. Definitly have Norton toolbar support for Opera & Google Chrome. I and im sure others want to fully switch from firefox or ie and use one of these 2. i wont switch until the toolbar is fully supported. I dont know why some people are saying make it lighter. its already nice the way it is. Free Version of NIS. No other AV company gives Internet Security for FREE. Go start for Norton. Fat Chance !!! Maybe not. Well, that is why we are paying SYMANTEC staff to THINK. I am below average user, but I am interested in the information. Norton is less buggy though. I agree. I'd like to see some of these suggestions incorporated into the current NIS 2010 product, rather than waiting another year for the 2011 release. 'Vulnerability Protection' - this isn't a feature; currently this information belongs on a web page right next to the Malware/Virus/Spyware threat list that the Norton software advises that it is protecting me against. As a user I don't care what you are protecting me against; I bought your software with the expectation that your software will address and adequately resolve, in conjunction with any malware I may have, any of the software/operating system/malware vulnerabilities I may have with my system. When I click on 'Vulnerability Protection' I expect to be notified of any updates to the programs that I have installed and a link to the vendor's site that will resolve the issue. So this is a fail on the current NIS 2010 versions behalf (17.1.0.19). Don't think so......definitely be included in NIS2011....it cost too much to add stuff into NIS2010...moreover most users has already paid for NIS2010...it will be too much of addition that is not feasible for Symantec. People buy a product not just when it first comes out, but throughout the whole year. Subscription starts when product is activated. The patches that come thru, I don't think are just fixes to a product, but should include improvements also. If people have to wait till next year to see improvements or better options, this is how Symantec will lose customers because some of the other products already offer the desired improvements. "People buy a product not just when it first comes out, but throughout the whole year. Subscription starts when product is activated. The patches that come thru, I don't think are just fixes to a product, but should include improvements also. If people have to wait till next year to see improvements or better options, this is how Symantec will lose customers because some of the other products already offer the desired improvements." I tend to agree with you. However, software development is far from easy, especially from a QA standpoint. Sometimes, more lead time is needed to incorporate enhancements into the product. The most important thing is that the "bugs" be corrected first. Once the actual product has been proven stable, consideration can be given to improved features. NIS is a complex product and while I have my own list of things that I would like changed, it is best, IMO, to have something that is rock-solid. A team of humans working on detecting and blocking threats in real-time - hours after they appear on the web. It's a must. 1) Improve scanning detection rates. 2)New feature thats blocks harmful sites (not only Phishing) eg) Known fake virus scanning sites). 3)A bigger variety of 'Main Background Themes'. 4)Full compactibility with 64Bit computers. 1. "Download Insight" and "Safe Web" features to Opera! It's big shame that Symantec support only IE and FF. 2. There should be option in settings, example "Unrated object" and choices "Allow/Ask/Deny". So when i have selected "Ask" and firewall is in automatic mode NIS decide program setting automatically but when NIS detect unrated object it ask from user that "what i should do". Now NIS just allow program execution and that is not good thing at all. I for one would first like to congratulate symantec on a job very well done with NIS 2010. I installed it on one of my two home computers about 5 days ago and love it! No problems at all. I was worried at first about my computer because I was never able to get NIS 2009 and IE8 to work together (ccsvchst.exe would lock up on restarts), but that is in the past now that NIS 2010 is out. IE8 and NIS 2010 are working beautifully together (hope I didn't just jinx it though ). The one improvement that would be great to implement in the 2011 version is a feature that physically blocks you from going to sites marked with yellow exclamation points or red x's by norton safeweb (with the option to disable this feature in the settings). Currently, NIS will only prevent you from entering a site if it detects phishing, while sites marked with red x's are allowed to load with just a pop-up being showed to the user. The only other thing I would like to mention is the ongoing fight to get toolbar support for more browsers like Chrome and Opera. In my opinion, even though this would be very nice to have (especially chrome ), it doesn't necessarily need to be a #1 priority until we see another browser reach at least 10% market share. That would be a good sign for symantec that not having support for whichever browser that is could actually result in a loss of potential customers. - Options being provided about which Background Tasks that you want to Run, e.g. Pulse Updates and no other Task should Run; there should be options for all Background Tasks either next to them or in the Settings, not really bothered where the Options are located. - Norton Safe Web Ratings on Search Results. - Being able to Run a Full System Scan from the Right-Click Menu. - Full System Scan being Completed in Safe Mode recorded by the Security History. - What Virus Definitions you have installed being displayed in the Security History, like the I.P.S. and W.P.D. are. I would like to see during the installation process some choices for the user to set or have some say in how strong they want something like Sonar to behave. Having to wait until the program is installed is many times too late to set your preferences. I have been seeing this with all the complaints about Sonar 2 now in the 2010 products and how it is eating up new exe files and programs. I have this concern about this Sonar 2 eating up very old programs too and old online computer games just because not that many people who use the old programs may be using Symantec products also. The installation might take a bit longer, but then it could be some what tweaked before all your programs which are safe are gone. Seeing all these problems with Sonar 2 is what is delaying me from wanting to try 2010 products. - Norton Safe Web Ratings on Images' Search Results. I'd also like to see all "Warning" and "Caution" Web Sites being Blocked, regardless of if they are Phishing Web Sites or not, as well as all Web Sites that haven't been Tested yet, a.k.a. Suspicious Web Sites, being Blocked. Number one on my wish list would be more control of SONAR. The topic has been seriously beaten in at least one other thread, but SONAR is frustrating in its present form. The intent to protect the user is good, but the inability to effectively override is not. I'm confident that Symantec can find a way to resolve this. I wanted to transfer my Login Data to another PC. It's quite simple to create a 'Backup' of the Data, transfer it to a Removeable device and then Restore Data from that. It works ok with/between NIS 2010 and N360. But could there be an Option when restoring the Data, to " Merge" the data with what is already in the Identity Safe ? At the moment the only option is to Overwrites any Data which is already there. This would save time and trouble. That's a good question and raises another one. What does "overwrite" mean, in this context. Clearly, if my old file had an entry for zipado.com and my new file had an entry for zipado.com, the old one would replace the new one. But what if my new file had an entry for hippydaze.net and my old file had no entry for hippydaze.net -- does that mean I would get to keep hippydaze.net? Or does "overwrite" actually mean "replace"; another linguistic marvel that confuses more than helps. I know that when microsoft warns that if I copy a folder over an existing folder of the same name, that data might get replaced, it means only that same named files will be affected, unique files will have no problem. From Dictionary.com: Update: to incorporate new or more accurate information; Upgrade: a new versionviz ------------------------------------------------------------------------------------------------------------------------------------------------------------Sorry if I wasn't clear enough.Using your signature, would it suit to say Merge means to UpdateOverwrite means to Upgrade ?Or perhaps I should have said that at the moment, all current data is deleted and replaced with the new data. boneidle wrote: ------------------------------------------------------------------------------------------------------------------------------------------------------------....Sorry if I wasn't clear enough.Using your signature, would it suit to say Merge means to UpdateOverwrite means to Upgrade ?Or perhaps I should have said that at the moment, all current data is deleted and replaced with the new data. I wasn't talking about your clarity, but Symantec's. Is that what you were told, that all current data is deleted and replaced with the data from the backup folder? So even non-conflicting data would be removed? If so, that is both sad and silly of Symantec. Not actually told as such, but after creating a backup of the Safe data on one pc, I networked it across to my Laptop. The Laptop had some saved, (different), logins already on it. I then did a restore from the stored Networked file. But it "Deleted " the logins already there, which I wanted to keep. It does say Replace so I suppose I should have expected the deletions. But I want to be able to Merge the 'Restore ' data with data already existing. The popup seems pretty explicit; it's going to replace [all] existing data with data stored in the backup. I assume that's because the data resides in a single file that is just overwriting the existing file, without regard to content. I don't use Identity Safe (I have another product I've used for years), but your suggestion for a "merge" option is logical. As mij noted, that's the norm elsewhere. Heck, I make a point of going through the settings of every knew piece of software I install, and even I missed it (and would have been crying if not for my own external backups). I suggest it be placed on the main Cards & Log-ins drop-down menu, or at the very least added to the Manage sub-menu. - The De-Fault Setting for "Early Load" to be "On" instead of "Off". - On the Download Insight window, the box with the information saying that if this is "Run", i.e. if you Select "Run this program", it will automatically be Run: The box is Checked by De-Fault; I would like to see the De-Fault Setting being changed so that this Box is Not Checked by De-Fault. Does this make sense? If not, please let me know; thank-you. - The symantec ThreatCon being added to the U.I., with information on why it is at that Level and Recommendations just below it. Maybe even have "Click Here For More Details". 2.Fix "Not Responding" bug in "Full History"
3.Don't delay the "Start Time" and "Shutdown time". 4. Warn user about "high risk website" every time user click a url. 5. Should have a tool that user can upload virus sample to Symantec without open their Internet Browser. 7. Improve "Safe Web Browsing": Not slowdown the Internet Speed too much. I noticed suggestions for Early load to be set to ON , by default . NO , NO , NO , please NO - this will slow down the start-up . This is not necessary because when installed on a clean machine , Norton is capable of well-protecting the computer! Whether 'Early Load' is ON or OFF is not a big deal. After all, it only takes 3 clicks and a scroll to change it, and it's only a one off job. A matter of personal choice, extra speed versus extra security. Me, I like it enabled. I agree. I haven't timed it, On versus Off, but I doubt there's any significant difference. On the other hand, getting NIS running as soon as possible does provide an added edge in security, particularly for those who have "always on" internet connections. A progress indicator of what percentage (or minutes of time is left) of files are done scanning when doing a full scan. (I am not referring to the current functionality of the number of files that have been scanned). I want to know how much time is actually left to complete a full scan. How in the world is Norton suppose to know how many files are on your computer??? Unless you did a frenzy installation of programs, expect the same download time as the last full scan. If I might point out to you and all the other posters so far on this topic, there is probably no time difference. The difference is when NIS is loaded. If it's loaded before you arrive at the desktop, then the desktop takes longer to appear but actual functionality upon arriving at the desktop comes sooner. If it's loaded after you arrive at the desktop, then the desktop appears sooner but actual functionality comes later. In other words, from the moment you boot-up your cold computer to the moment you can start writing a document in MS Word (for example) should be just about the same regardless of when NIS kicks in. If not, I would be in interested in the percentage difference in time. - What Activities were accurately detected by Sonar3 , Model could be the Process Activities List of Norton Antibot.